We started out East of Fred Meyer on Hawthorne, after driving past all the delicious looking eateries we decided to just park somewhere and start trying restaurants. Here was our first pick. The funniest part was halfway through the meal when two little girls, probably about 10 years old, hopped off their bikes, helmets in hand, and strolled in asking for a table for two. They proceeded to order their meals and eat delicately with chopsticks while giggling and writing in what appeared to be a shared diary. Hilarious! We tried a salad and some curry noodles (which were so delicious we started eating and forgot to take pictures). 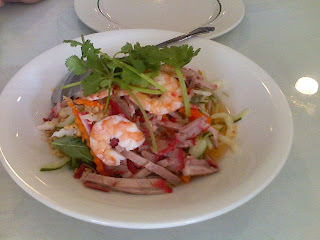 Here's the salad though: A delightful combination of shrimp, sliced pork, slivered cucumbers, and cilantro with a light, sweet and tangy sauce. Seriously good. I might go back just for the salad. We actually stopped at Myo Sushi at this point, but again, forgot to take pictures and went right ahead with the eating. We tried their new Mt. Rainier roll, which was pretty good, although not in the superb category. I like Myo Sushi off 23rd and hadn't ever tried this one. It was very busy so I'm assuming it's quite popular with the locals. They had a sign-up sheet for a table hanging beside the door, so they must get quite a line-up at times. This was by far our favorite! Kabobi. 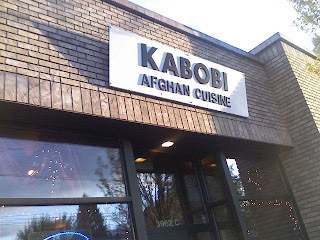 I never thought much about Afghani cuisine before seeing this place. It's a great combination of Middle Eastern, Indian, North African and probably Mediterannean styles. I'm not exactly sure, but whatever it was it was awesome! Again, though, we got so excited to try it that we forgot pictures. I wasn't very well prepared for my first food crawl. I promise to get better about the pics. In the meantime here's a description of the food. We got the special plate for 15.00. It was tender lamb kabob that was spiced to perfection, long grain rice with some kind of spice in it, lentils with sweet spices, some kind of spinach dish with a creamy consistency, meatballs in a red sauce, and garlic naan. It was all served with some kind of yogurt type sauce a little like tzatziki. The service was attentive and friendly, but not annoying. And, to top it off there was a self service chai table. Yum! Okay, so this was a little later into the evening. A friend joined us at Nick's Famous Coney Island for a drink and, since he hadn't been on the earlier food crawl, a little snack of french fries. The drink was called a Dirty Hudson and had Jaeger sitting on the top and bottom of it so it looked like a dirty river. But it tasted like candy. Mmmm. :) Nick's has Ladies Night all night on Saturdays. Perfect $3 Lemon drops means I'll definitely be back to this diner style spot that moonlights as a comfy bar. Oh my! It doesn't look like much here, but this is a little parking lot on 10th and Hawthorne that opens up from 8pm -3am. 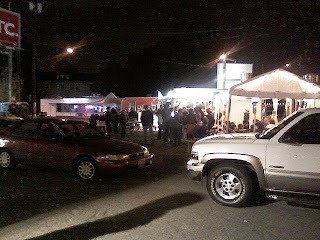 It is full of little food carts with canopies, tables, heat lamps, the works. People were stopping by in cars, on bikes, and by foot. The place was quite a hangout, even on a rainy night. The choices: Belgian fries with an array of sauces, putine (the national food of Quebec, which is not actually a nation), BBQ ribs and chicken (or an option of tofu dogs), giant burritos, sweet or savory crepes, and a pasta truck with random pasta dishes. I hope you vicariously enjoyed this Hawthorne Food Crawl. I'll be doing one in Salem soon and will be sure to post it all here. I'll really try to be better about pictures this time! Let me know if there is an area I should check out for another food crawl for this series. So, I'm going to start a new series called Food Crawls. It started in the Hawthorne District in Portland last weekend. I was with a couple of friends who really felt like having tapas, the spanish idea of many small plates of flavorful food to share. We didn't see any Spanish restaurants in the area and decided to make our own small plates menu by going to a smattering of restaurants in the area. At each restaurant we ordered a dish or two to share and ended up with some of the most delightful "tapas" ever! Order one plate of food and ask for extra plates. Split food evenly among the group. Eat, while chatting and enjoying each others company. Move on to the next place when you are ready and repeat. Allow at least 2 hours and 3 restaurants for ultimate enjoyment. Salemites.com is now officially online. We have our own spot to gather local information and resources. A place to find out what's going on in our area. A place where Salem and Salemites rule. Wow, I can't believe what a bad blogger I've been. I haven't had a new post for over a week! What will all my lovely readers do without my wise words about life in Salem?? Okay, I'm sure you were all fine, but I'm back now. The Salem Film Festival was a great success. At least by my standards as a consumer of the event. It was pretty well organized, very well attended, and the films were fantastic. Most of the films I saw were either packed to the hilt with extra chairs set up in the theaters, or there was a second showing added. Sometimes both. It was really exciting to see that much attendance. The one thing I noticed was that I was often the youngest person in the room. Where were all the college students? It was actually pretty cheap, so that can't be it. I bought a Ten Flix pass and it turned out to be $60. That's $6 per film. And you could share it with as many people as you wanted (I took a friend to each film and they just paid me their share. It worked out really well). I saw five films in all and I would recommend all of them. Well, technically one was a bunch of short films in one sitting, so I actually saw more than five. A couple of those I might only recommend to artistic types, but most of them were excellent. I hope you got to some of the films at the festival, but if not you can still see some of them as they come through for real runs at Salem Cinema. The new theater is a beautiful, art deco style and with it's three theaters, will be able to show lots more great films. Who said there's nothing to do in Salem?? I'm so excited! I'm heading down in a little while to pick up my Ten Flix pass for the Salem Film Festival. So many films looked good that I couldn't resist. I don't really have time to watch as many as I would like, but I'm going to try to fit in at least 6. The great thing about the Ten Flix Pass is that you can share it with friends. It's just like a punch card. It turns out to be $6 per movie! That's way cheaper than a regular movie theater and you get some really great, high quality films for that price. So I plan on seeing a film this afternoon with a friend, walking around downtown until we find something that looks delicious to eat, and then seeing another film in the early evening. Then I think we are going to top it off with a trip to the Roxxy for some blues music and a beer. And all this will probably cost less than $40. Seriously. Don't tell me there's nothing to do in Salem. It's out there if you just go out and find it. So I offered to drive a friend around to different parts of town where she might want to live. She is moving here from the teeny, tiny little town of Amity and is a little scared to live in the big city. She wants to live in a place where she feels safe at night when her husband is working nights. They are going to be renting as it is probably a temporary (2-3 year) thing. She also doesn't want to have to deal with a lot of crazy neighbors. So, those are her requirements. Anybody have any suggestions as to what parts of town I might show her? Or know of any rentals in a nice neighborhood? I have a few areas in mind, but I'd appreciate any suggestions. Well, for those who don't know, I am an active member of CAN-DO, the Central Area Neighborhood Association. Here is a link to the map of the CAN-DO area. I would love to invite anyone interested in coming to our Annual Meeting, to show up at the Salem Conference Center tomorrow at 6 PM. There will be a notice when you enter of which room we will be in. For more info from the newsletter click here. For more info on CAN-DO in general go to our website here or click on the link I have placed on the sidebar. Membership is for anyone living, doing business, working or owning property in the CAN-DO area. If you have any kind of business or interest in the downtown area, you pretty much qualify. If you don't fall into the CAN-DO category, please look into joining the neighborhood association in your area. It is a great way to have a voice in the city and in your local community. I've been driving by this sign in Keizer for months now. And I did a lot of wondering about exactly what it meant. Did massage therapists get together and exchange massages or something? Fortunately, a friend filled me on on what they do so that I too could benefit from this really awesome service. Fresh Start Massage Co-op is a group of massage therapists that are new or need to build clientele. They work out of one building and they provide many different types of massage. The best part is that they cost only $40 for an hour massage! They have a really nice website that allows you to see what times are available, which therapist is available, and sign up for a massage right there on their site. They send a confirmation by e-mail or phone, whichever you choose. They are in the process of moving from Keizer to over off of Hyacinth, near Portland Rd and the I-5 interchange. They have a new building back in the area where State Farm used to have their offices (the one that is now a state building). So, I have a little questionaire for everyone. What is your overall favorite place for Thai food? Which is the best atmosphere? Which is the best food? I went to Thai Cuisine last night. It is on in the little old house on River Rd. in Keizer. I haven't been there for awhile and I had a pretty good experience. It's very quaint. I sort of felt like I was having dinner at my Thai grandmother's house. If I had a Thai grandmother, anyway. The walls have a floral wallpaper on top with wood paneling below. It's carpeted so the noise level is low. The restaurant is cut up into different rooms, so each space only has three or four tables. All in all, I really like the atmosphere. Of course, there was the customary decor: ornate gold-trimmed frames around animal or landscape scenes, the good luck cat with his paw in the air, and the ever-present photographs of the rightful King and Queen of Thailand. But somehow I don't think I would really enjoy Thai food in the same way without these relics. The Pad Thai and Mango Delight we shared were delicious. The mango dish was particularly yummy. The Pad Thai was just so-so. I like mine with a little spice and when I asked for mild, it came out REALLY mild. Like they might have forgotten it altogether. The Mango Delight so made up for it though, that I didn't really mind. We ended with a little Thai Tapioca for dessert. It was really tasty and warm, but I found that I didn't really have an appetite for too many of the chewy little balls of delicousness. I guess I can only handle gelatin substances in small doses. I think I might give it a "Best Atmosphere" rating, although it would not come in first for food, in my opinion. Feel free to disagree with me in your comments though. 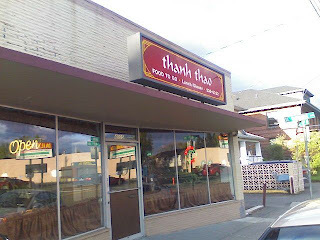 I'm wondering where everyone else likes to go for Thai. I have been reminded the last couple of days of how small this town sometimes is. Last night I had a couple of friends over to my place. We'll call them M and J. M not only knows my landlord, but also the business owner of the neighboring business. J knows my next door neighbor who happens to work with the husband of J and M's coworker (J and M work together). Did you catch all that? Now, if it had truly been a small town, we would have figured out that somebody was married to somebody else's cousin or something. I also wandered over to SLAB, the soap store in the Reed. I have walked by it so many times thinking that I needed to go in, but this time I actually stopped to smell the soaps and buy a couple for my bath. Now, you'll all be able to find me by following the Black Cherry or Ginger Peach smell wafting off my skin as I walk around town. Did anyone head over to Riverfront Park over these past few beautiful days? Did anyone head down to the end of the park where the new Railroad bridge will soon be opening? Did you happen to notice the hordes of people pleasantly strolling and biking right past the "No trespassing," "You will be fined," "This area monitored by camera" signs? Because I did. Now, I'm not admitting to any guilt here myself. :) I'm just saying there was no stopping people from that bridge once the sun came out. I can see that it is going to be extremely popular. Especially on nice, sunny, summery days like the last few we've had. I will admit that I got a lot of walking in this weekend. In and around Salem there are some beautiful walking trails and areas. I even made it up to the Wheatland Ferry area and walked on some of the trails around Willamette Mission Park. Just a little tip for you in this economic crisis. Did you know that if you park at the Ferry the parking is free, but it costs the $3 daily fee to park inside the park itself? Note: Apparently the roadside parking is free. The parking lot is still part of the park. Still, there's plenty of roadside parking. Apparently, we are supposed to have 70 degree weather this weekend. It was all over the news last night. Pretty sad when a sunny day makes headlines. Well, yay! That's all I have to say about it. I'm ready for it. Somehow I acclimated extremely quickly to the warm weather of Southern Cali and I have been cold ever since I came home. I'm pretty sure the nurseries and home improvement stores are going to be really busy this weekend. This idea on Emily's site. Fantastic! T-shirts supporting Salem. I mean, why not? All the cool town's are doing it. Plus, I say if it is socially acceptable for grown-ups to wear T-shirts with Eeyore on them, or teenagers to wear a marijuana leaf T-shirt, why shouldn't we have one that celebrates Salem. After all, it seems like anything goes. (I just reread that last sentence and it seems like I might be comparing Salem to Eeyore and pot. Hmmm. If the shoe fits...). Also, I tried the split pea soup from Cindy's recipe site a couple weeks ago and now I'm dying to try this new one for Pork Chile Verde. And this. Absolutely hilarious! Why, oh why, would you name a place Soup and 'Balls??? Reminds me a little of Von's Corner on Portland Rd. It's a bar that everyone should walk into once just for the experience. And then promptly walk back out. Happy First Wednesday, everyone! Hope to see you downtown.